A skilfully shaped Olive tree in a sheltered garden spot produces priceless architectural beauty, similarly to sculpture or a building's curved elevation. 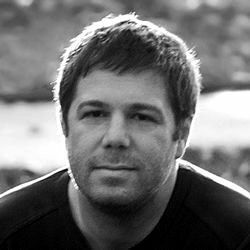 Yet, while structural architecture remains forever static, Birch, Maple, Olive, Palm and Pine trees enhance an outdoor space gradually with ever-changing silhouettes, seasonal transition and sound, while sustaining diverse wildlife. 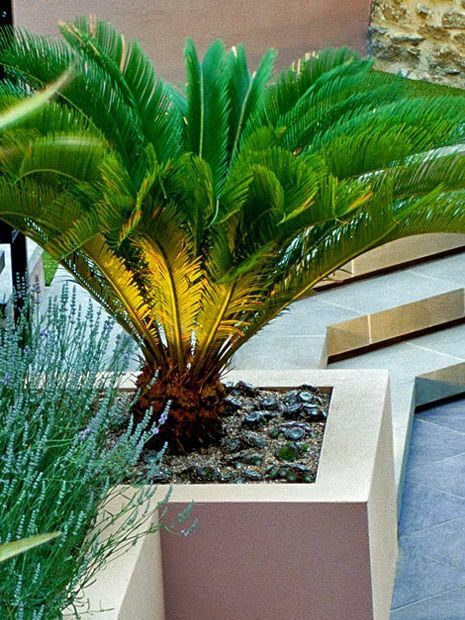 The philosophy behind the ancient art of architectural gardens is deeply rooted in classic design traditions, and we continually redefine its pivotal mindset by producing dynamic landscaping, amid clean contemporary outlines. 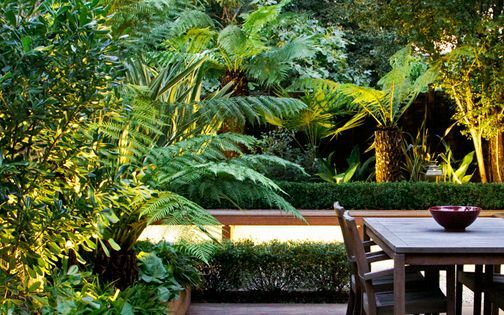 Designing gardens in warm climates distinctly varies from creating soft landscaping in Western Europe's mild temperate weather, where exotic flora provides an inspiring, limitless supply of architecturally charismatic vegetation. 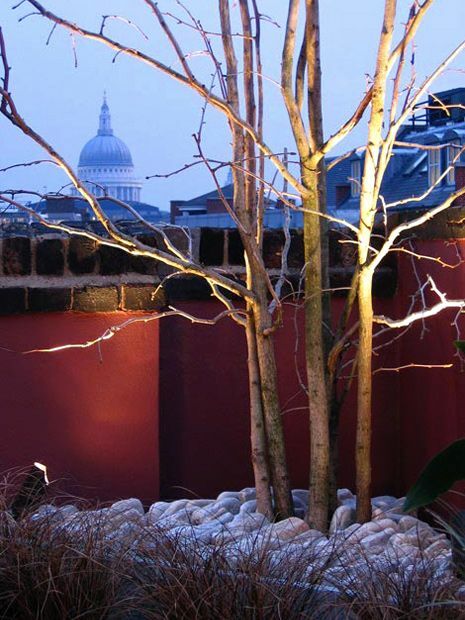 Working predominantly within London city gardens and roof terraces, we practise restraint to elevate available plant species, where creative integration of sculptural shrubs and trees generates essential focal points, and vitalises urban outdoors. With countless specimen plant nurseries across Europe, the spectrum of sizeable plants imported daily into the UK is unrivalled. 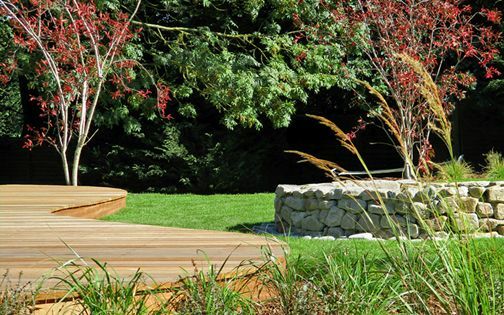 One of our principal tasks as garden designers and project managers focuses on maximising clients' plant itineraries and applying them optimally and flawlessly into functional landscape design layouts. A comprehensive grasp of growth rate, maintenance requirements and winter hardiness, coupled with profound, site-specific insight, provide a solid platform from which to fully endorse specimen plant price tags, or an intricate hedge design outlay. We consistently select all plants hands-on at the nurseries to enhance projects with unique, diverse flora, and provide our clients with high-quality architectural specimens. 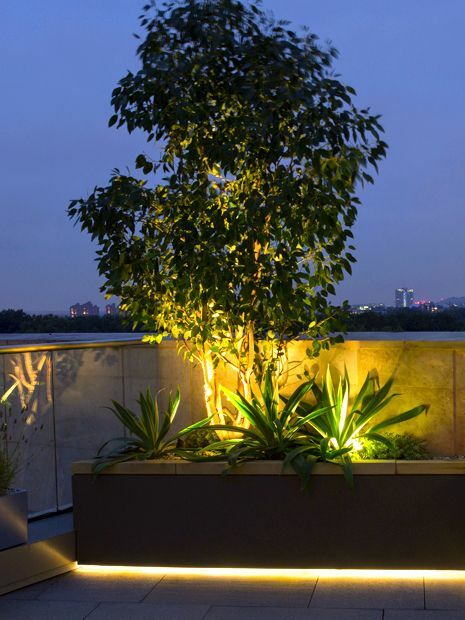 A multi stem Pine tree appears spectacular at dusk, as light beams project into its canopy, enhancing bark, form and foliage attributes, while further balance is achieved by accommodating all of the plant's elevations with multiple fittings. 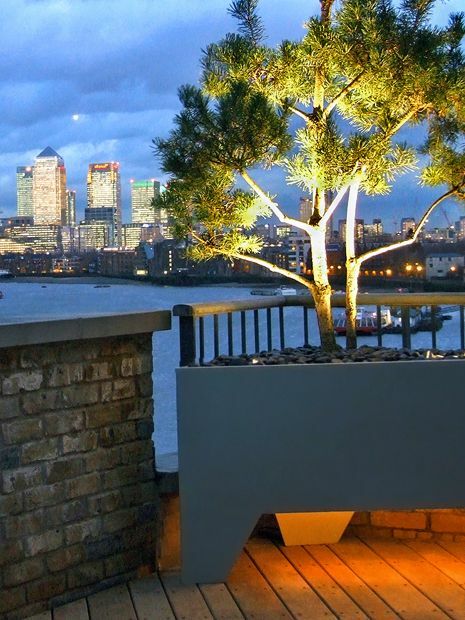 We distinguish key specimens in our outdoor lighting blueprints, forming distinct landscaped showpieces, where downlights' projection through sculptural branches generates gentle silhouettes onto surfaces. Aligning a narrow beam along the smooth trunk of a Paper bark maple or a Silver birch accentuates individual structural beauty and refines inherent textural qualities. At times, we're tempted to select a plant we adore, yet the location lacks suitable conditions or space. When first visiting a garden, we appraise which plants thrive in nearby gardens and local parks. We survey the orientation on a compass and observe seasonal changes, shade patterns, soil type, available moisture and assess wildlife and environmental factors. London's high rainfall necessitates adequate drainage, where raised beds and bespoke planters produce platforms to sustain specimen planting, augmented by automatic irrigation which provides further water for specific groupings. 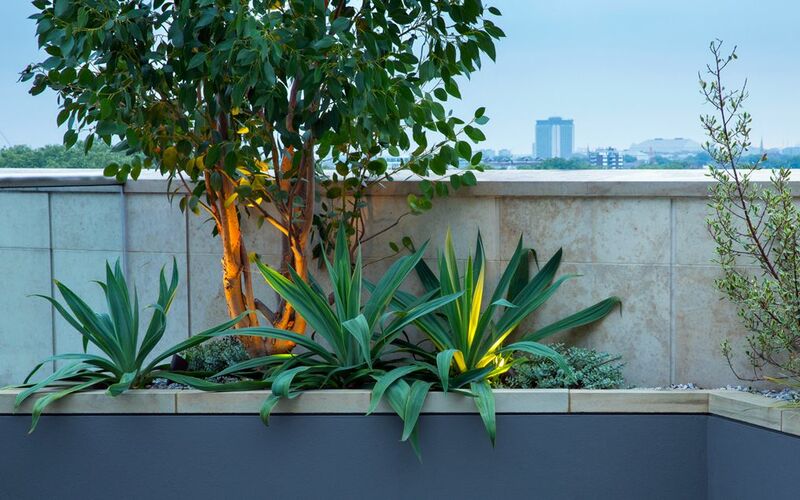 Automatic irrigation is pivotal in sustaining and maximising plant growth across both garden and roof terrace landscape designs. 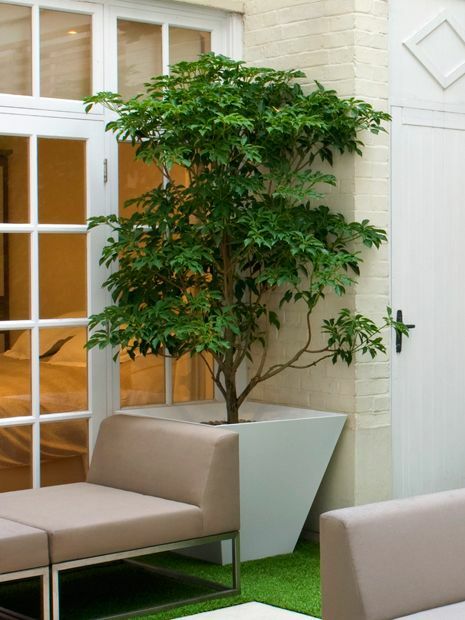 Small pot sizes and large tree specimens equally require plenty of moisture when acclimatising in new environments. Laying out pipes in advance and setting suitable nozzle intervals fulfils the varied requirements of individual plants, while multi-seasonal water programming, efficiently adjusted, promotes resilient, thriving cultivation. A well-designed and adequately maintained irrigation system sustains built-in raised beds and rooftop planting effectively, where compost continually dries up due to drying winds, rapid drainage and overhanging canopies. 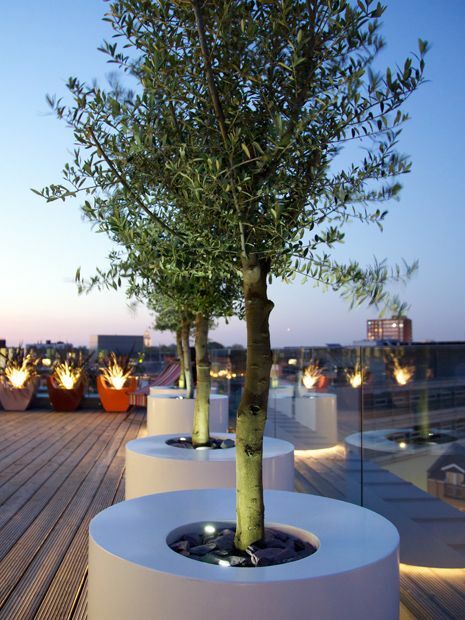 Every now and again, clients ask us to plant an Olive tree where sunlight is scarce and drainage is rather insufficient. If there's no fitting alternative, we improve soil aeration and enhance planting mediums to accommodate this prospect, since plant cultivation is ultimately shaped by experience – nurtured by lifelong observation. Fig, Olive and Palm trees often sustain diverse growing conditions, and thrive in unexpected London settings, producing larger leaves. Likewise, Yellow groove bamboo cultivars form definitive selections when seeking compelling focal points, and we continually develop innovative methods to display Bamboo species. 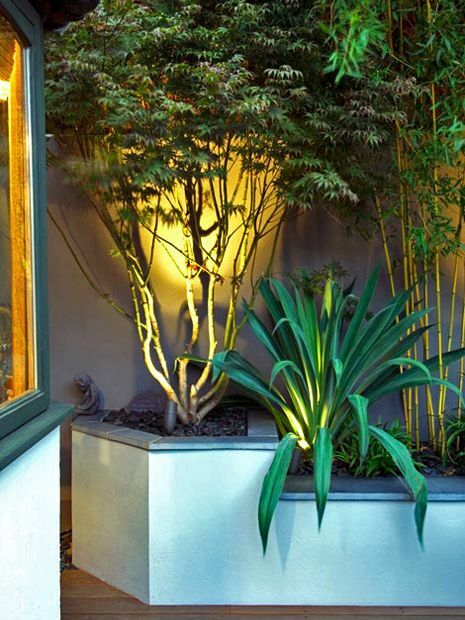 In this Shoreditch garden, a clump of clear Bamboo canes emanates from an inverted light well constructed as its home, in the shade and shelter of a small city garden, to architecturally animate a tiny patio space. Occasionally, there are certain city locations where it's unfeasible to hoist a large tree specimen into a site, specifically in urban rooftop settings and terraced houses. 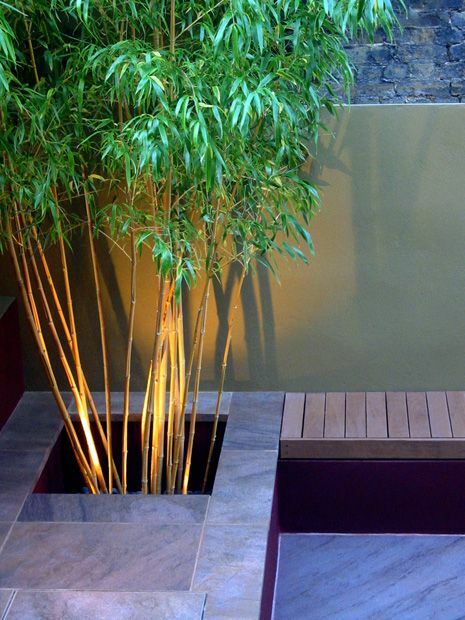 We mitigate this logistic dilemma by utilising bendable plants carried through stairways or paths, such as Bamboo, Silver birch and Willow species. 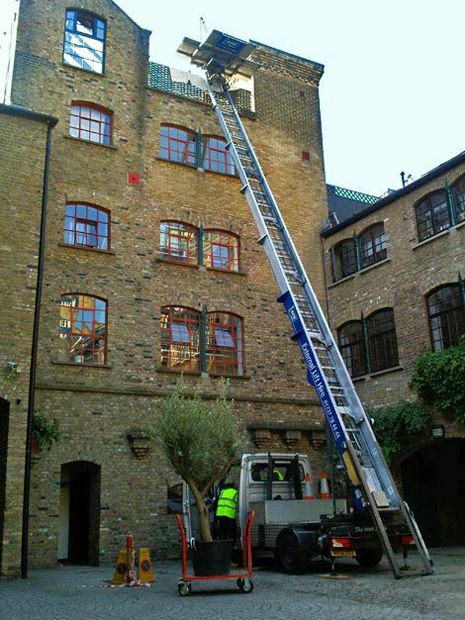 Where vehicular access is available, we hire a compact furniture lift to transfer sizeable plant specimens, and once on site, the plants are stabilised to minimise toppling over in gusty wind. When we plant up tall raised beds and oversized planters, we hoist plants into position by building ramps, stacking surplus delivery pallets, or hiring a nifty Ginny lift. Planting tender species in London's clay ground presents a frost damage likelihood; indeed, it can be tempting to source a beautiful exotic plant which has grown in top-notch conditions in a European polytunnel, yet giving it a suitable home requires ample preparation. We prefer semi-hardy plants in small pot sizes, as they acclimatise readily. 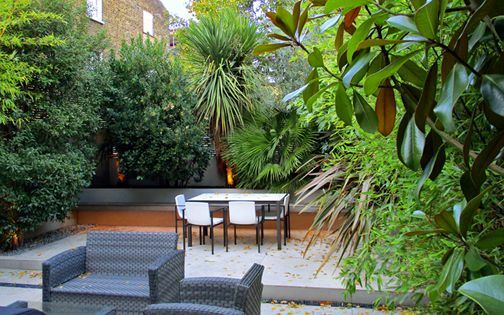 The knack is to introduce species which seem exotic, yet are winter-hardy, to produce a thriving lush London garden. A sheltered position, great drainage and efficient irrigation are paramount when cultivating less hardy floras in cold climates, as plants often wilt due to repeatedly waterlogged roots rather than air frost. There aren't many evergreen architectural plants native to Western Europe, and this aspect entails alternative design uses for available species, as well as seeking new flora prospects. 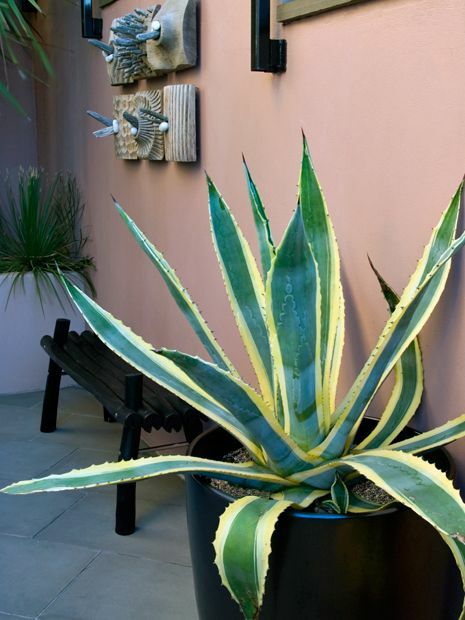 When requiring long-term, robust planting solutions for low upkeep urban town gardens, we frequently incorporate genera such as Agapanthus, Abelia, Acacia, Agave, Arbutus, Astelia, Beschorneria, Blechnum, Butia, Chamaerops, Coprosma, Cordyline, Cork oak, Crinodendron, Dasylirion, Dicksonia, Equisetum, Eriobotrya, Eucalyptus, Fatsia, Nandina, Olive, Phormium, Phyllostachys, Pinus, Portuguese laurel, Pittosporum, Pseudopanax, Southern magnolia, Trachycarpus, Trochodendron and Yucca. Deciduous architectural specimens are available in abundance throughout Western Europe, with native garden species aplenty, yet one of our great favourites, Lagerstroemia, the Crape Myrtle, is from Northern Australia! 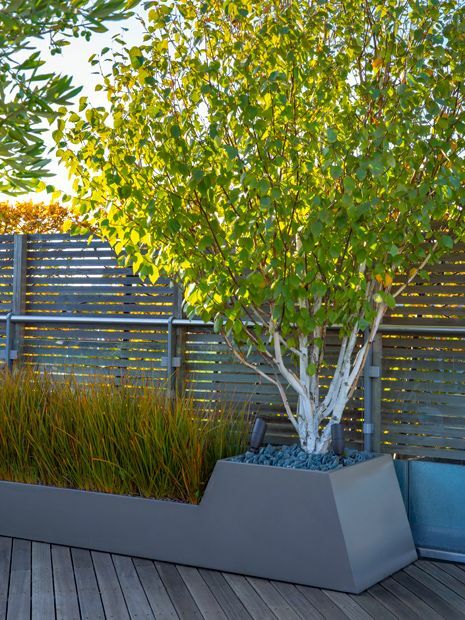 Deciduous trees enhance seasonal change; their outline and bark brought to the fore in wintertime, when structural planting is revealed and easier to prune while crowns are accessible – conveying the essence of modern gardens among urban backdrops. 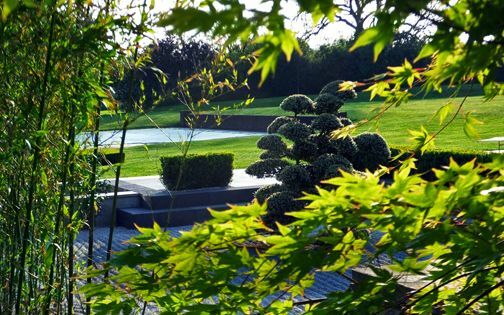 We love to integrate Acer griseum, as well as Acer palmatum, Aralia, Betula, Catalpa, Ficus carica, Ginkgo biloba, Gunnera, Magnolia, Paulownia and intriguing cultivars of native Corylus, Cornus, Euonymus, Salix, Sorbus and Viburnum. 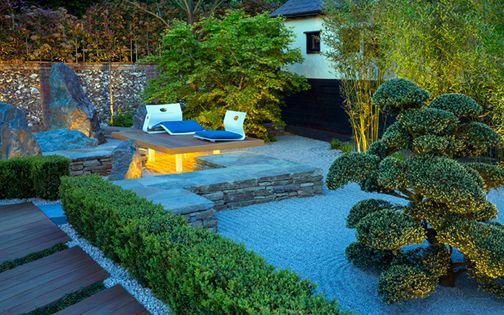 Most architectural outdoor designs require minimal maintenance, where many Mediterranean gardens sustain a diverse spectrum of unfussy evergreen vegetations. Yet, upkeep in warm climates is at times greater due to plants' rapid growth rate, when crowns become inaccessible while at full height. 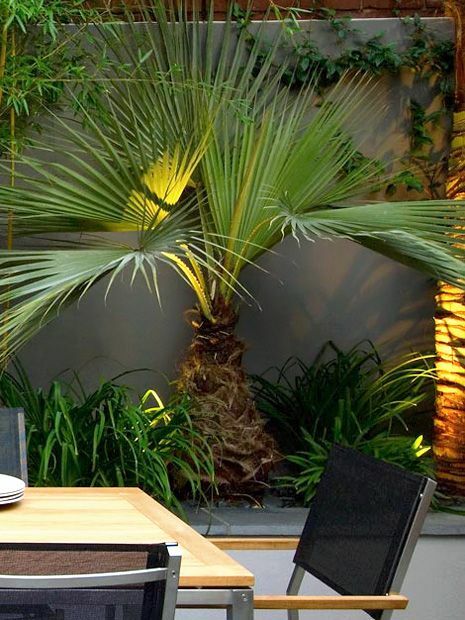 Around most of the UK, architectural plants are slow-growing, where it's easier to thin Palm tree canopies and transform their outline from rounded to pyramidal, producing a silhouette highly conducive to immersive outdoor lighting. Removing the fibres of a Trachycarpus palm reveals beautiful bark patterns, updating an ordinary trunk into an exotic, living woody motif. It's not essential to grasp the nitty-gritty of garden architecture to immerse in beautiful architectural plants and trees. This living, green network, woven throughout timeless landscapes, marks our histories, travels and places, and it's the beauty we find in a Eucalypt's flaking bark, a gnarled Olive tree's contorted stem, or an ancient Bristlecone pine's hollow trunk, which sustains a continual passion for cultivating graceful plants in our own humble plots. 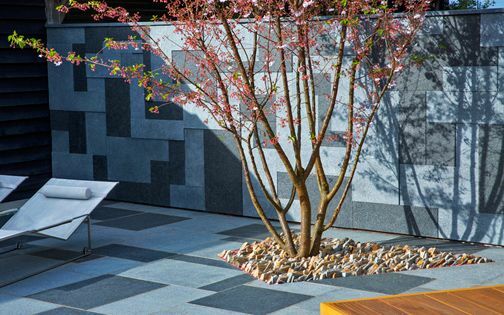 The genius of architectural gardens universally drives the design principles of outdoor spaces – to form sculptural silhouettes in greener and far heavenlier places!